Armed Forces Minister Florence Parly and Steven Vandeput, Federal Minister of Defense of the Kingdom of Belgium, today in Paris signed an unprecedented intergovernmental framework agreement which anchors the long term, strategic partnership on "Motorized Capability - CAMO". The agreement was signed in Paris, on the sidelines of the 1st ministerial meeting of the European Intervention Initiative (IEI). The Armed Forces Minister is delighted by this major agreement which strengthens an already strong cooperation between the French and Belgian armies, and opens the way towards a greater operationality of our forces. In addition to marking an important step towards European defense, this agreement will allow important economic benefits in France as in Belgium. This agreement embodies a concrete vision of European defense that is built through partnerships where the States combine their forces to better serve the security of European citizens. This unique partnership includes the sale of 382 Griffon and 60 Jaguar armored vehicles to the Belgian Army. It also includes an operational component that covers training and operational maintenance of the equipment. Finally, a joint office between the French Ministry of the Armed Forces and the Belgian Ministry of Defense will be set up to manage the evolution of these armored vehicles, ensuring that it is mutually beneficial to both countries. 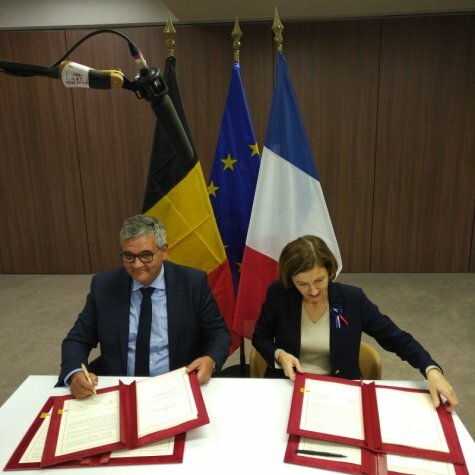 -- In June 2017, Florence Parly, Minister of the Armed Forces, signed a letter of intent with Belgium to move towards a closer bilateral cooperation in the field of army equipment. -- On 25 October 2018, the Council of Ministers of the Kingdom of Belgium approved the principle of an intergovernmental agreement with France concerning the setting up of a strategic partnership in the field of land mobility. -- This is the intergovernmental agreement signed yesterday. -- The armored vehicles will be delivered to Belgium from 2025. -- The acquisition covers 382 VBMR-GRIFFON and 60 EBRC-JAGUAR vehicles. The total investment budget amounts to around 1.5 billion euros. -- The French manufacturers who build these armored vehicles are for the Griffon and the Jaguar, including: Nexter, Thales, Arquus, Quiri, SNC Hutchinson, Elno, Metravib, Safran, TRAC-C industry, Texelis. -- The French Army will participate in training with the Belgian military. -- The Directorate General of Material Resources (DGMR) and the Directorate General of Armament (DGA) will cooperate in an unprecedented way, by the establishment of a joint program office to manage the acquisition. -- The collaboration between the two directorates will allow the development of synergies, in the areas of expertise and testing, and close consultation on future needs.